Barrow is a familiar sight to motorists on the A66 north of Keswick. As you pass Portinscale the grassy path up Barrow's north ridge comes into sight, framed by the higher fells behind. The fell itself is less familiar ground to most walkers, but it makes a very satisfactory shorter walk. The fell is almost isolated from other high ground - Barrow Door leading to Stile End is the only ridge walk, and this means that the steep sided fell has great views. The walk up Barrow's northern ridge has much in common with the more famous walk up nearby Cat Bells - in both cases the walker is on a wide grassy ridge, with steep slopes on either side, the odd patch of exposed rock and amazing views. Cat Bells has the steeper sides, more rock and the stunning view of Derwent Water, but it also has the crowds. Barrow can offer just as good a view of the Newlands scene, a splendid side-on view of Causey Pike, a view into Cole Dale and no crowds! There really are only two ways to the summit of Barrow - along the northern ridge from Braithwaite or up from Barrow Door, the col between Barrow and Stile End. The other slopes are all too steep for easy ascent and the eastern slopes include the dangerous spoil heaps of Barrow Mine. 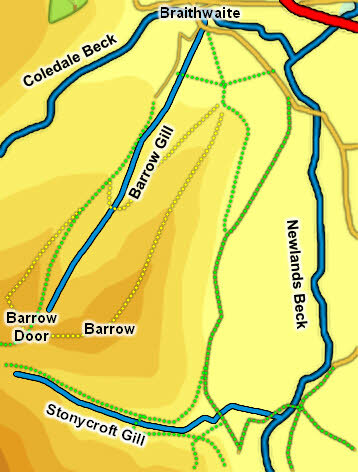 We have a walk that ascends Barrow, passes Barrow Door and returns to Braithwaite via Stile End. At the summit there is a small patch of exposed rock, surrounded by a circle of grass before the heather takes over. This is the best viewpoint for most directions, although a false summit just down the ridge blocks the view back down towards Braithwaite. Barrow sits in the middle of four streams. To the south Stonycroft Gill runs past the foot of the fell, running into Newlands Beck. Newlands Beck forms the eastern boundary of the fell - the eastern slopes drop steeply down to the road then flatten out before they reach the stream. To the east is Barrow Gill, which rises close to Barrow Door, and then flows through a dramatic ravine on its way to Braithwaite. In the village Barrow Gill flows into Coledale Beck, which runs across the northern tip of the beck and flows into Newlands Beck. The fell is thus almost completely surrounded by streams, with the only gap been the 200 meters between Stonycroft Gill and the start of Barrow Gill. Barrow used to be the site of Barrow Mine, and the eastern slopes still contain a sizable and rather delicate spoil heap, which has to be kept off the road below. On the western flank Barrow Gill is a normal stream in its upper reaches, but just before High Coledale it suddenly plunges into a very impressive ravine, which runs almost into Braithwaite village.